APGC Technical Note: Why Use APGC? In 2015, Mass Spec Lab added to its instrumental portfolio a powerful new “soft” ionization Atmospheric Pressure Gas Chromatography (APGC) interface at the front end of its quadrupole time-of-flight (QTof) mass spectrometer. The APGC interface includes a 7890 Agilent gas chromatograph and an APGC source. The APGC source is comprised of a heated line, an atmospheric pressure ionization (API) corona pin, and sample cone. Together these function to transport and focus the GC column eluent into the ionizing region around the API corona pin and finally direct the ion stream into the high vacuum ion optics of the Tof. Unlike traditional GC-MS platforms, ion formation in APGC occurs at atmospheric pressure in nitrogen gas and affords “soft” ionization typically yielding molecular ions with minimal in-source fragmentation. The combination of APGC “soft” ionization with the sensitivity and mass accuracy of the high resolution QTof instrument delivers analyte detection limits in the low parts per billion (ppb) and analyte mass accuracies in the low ppm. Data with the precision and accuracy of Tof detection are unattainable with conventional unit resolution GC-MS analyzers (e.g., single quadrupole instruments). Even so, unit resolution GC-MS analyzers are used for the bulk of most standard volatile and semi-volatile analyses even though their unit mass accuracy makes it impossible to narrow down the chemical formula candidates for an analyte to a practical number. Chemical identification with unit resolution mass analyzers depends almost entirely on mass spectral matching to 70eV electron ionization (EI) fragment libraries such as NIST1 and the Wiley Registy. Hence, if the mass spectrum of an analyte of interest is not present in these libraries then chemical identification is typically unachievable. 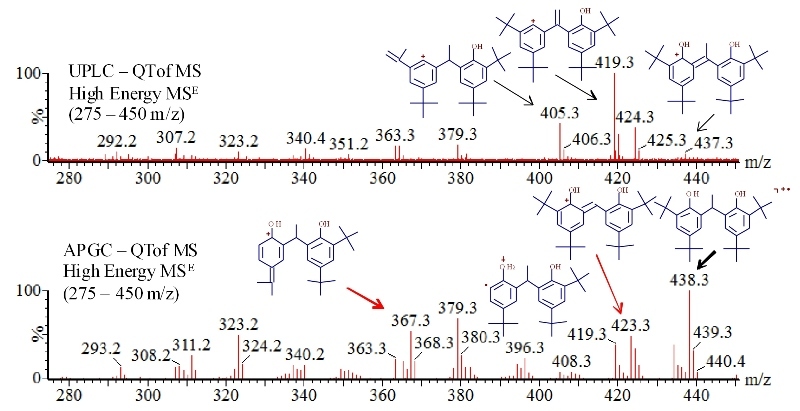 Unfortunately, mass spectra of many volatile compounds are not found in these fragment libraries, especially degradants, contaminants and by-products. With the mass accuracy of APGC QTof it is possible to narrow down any volatile analyte’s candidate chemical formulas to a short list that can ultimately lead to unambiguous identification. In this technical note, we investigated APGC-QTof ionization and fragment spectra obtained in the analysis of a model plastics additive, 2,2’-Ethylidene-bis (4,6-di-tert-butylphenol), CAS #35958-30-6, also known in the additives industry as Vanox 1290. Compounding of low concentrations of this additive into plastics protects against thermo-oxidative degradation during processing, storage and end use. Plastics additives similar to Vanox 1290 can be detected in extracts of plastics or in extracts of materials in direct contact with plastics (e.g., food, drugs, biomedical devices). If such analytes are detected, chemical regulations often require their chemical identification and quantification. Mass spectrometry is the preferred method. It is generally known that APGC-Tof provides substantial sensitivity gains over GC-EI-MS and GC-CI-MS (EI=electron ionization; CI=chemical ionization). We demonstrate a number of additional benefits in this technical report. In particular we show data demonstrating more than 1000 fold improvement in APGC mass accuracy over conventional GC-EI-MS and GC-CI-MS, as well as data highlighting the uniqueness of APGC spectra at both low and high collision energy in comparison to GC-EI-MS and UPLC-ESI-QTof spectra. As seen in Figure 1, at low collision energy the soft nature of APGC ionization yields an intense signal (107 ion count intensity) for intact Vanox 1290 ion (2 ppm concentration) with exact monoisotopic mass measured at 438.3494 m/z, equivalent to a mass accuracy of 0.9ppm based on a theoretical monoisotopic mass of 438.34982. In comparison, the Vanox 1290 molecular ion peak in the GC-EI-MS spectrum only showed unit resolution at 438 m/z. As a rule, the APGC coupled to the QTof system routinely yields mass accuracies for low energy spectra of less than 3 ppm, which at the exact mass of intact Vanox 1290, is accuracy to the third or even fourth decimal place. The molecular ion intensities displayed in the APGC-QTof-MS and GC-EI-MS spectra in Figure 1 are notably different. The molecular ion dominates the APGC spectrum reflecting the soft ionization conditions of APGC with no added collision energy. Clearly, fragment ions dominate the GC-EI-MS spectrum, though this behavior is expected with the 70eV ionization energy applied to the analyte. Unlike GC-EI-MS, GC-CI-MS is a soft ionization method which also yields molecular ion dominated spectra akin to the APGC spectrum in Figure 1. However, GC-CI-MS spectra (not shown) have problems such as background noise (poor sensitivity) and the usual unit mass resolution that can obstruct chemical identification. APGC soft ionization coupled with accurate mass and high sensitivity is an important alternative to conventional GC-CI-MS. Comparison of low energy APGC-QTof MSE spectrum of Vanox 1290 (left bottom) to NIST library GC-EI-MS spectrum (left top). Note the high molecular ion intensity and low in-source fragmentationin APGC spectrum. MassFrontier (HighChem, Thermo) assisted with the 233.1907 m/z fragment accurate mass assignment. It is possible to generate fragment ion spectra with APGC QTof that are similar to a traditional EI spectra. This is accomplished with application of user controlled collision energy in the collision cell of the QTof ion optics. Because traditional GC-EI-MS and APGC ionization mechanisms both kick off an electron and produce the radical cation (M+.) molecular ion, one might expect that the fragment ions generated from this common precursor would be the same. However, there are notable differences between the GC-EI and APGC spectra in Figure 2. APGC derived fragmentation spectra produce additional high molecular weight fragments compared to 70eV spectra and therefore provide greater information for MS-based structural characterization (Figure 2). Comparison of high energy APGC-QTof MSE spectrum of Vanox 1290 (left bottom) to NIST library EI GC-MS spectrum (left top). Note the intensity of high molecular weight fragments in the expanded inset spectrum of the 275 to 500 m/z region. ESI (electrospray ionization) UPLC-QTof MS spectra and high energy APGC QTof spectra also show information-rich fragment differences in Figure 3 due to the distinctly different molecular ions each generates - protonated cation (M+H+) for ESI and radical cation (M+.) for APGC. A number of the experimentally detected fragment differences displayed in Figure 3 were predicted by MassFrontier fragmentation elucidation software. Starting with a M+H+ precursor ion, Mass Frontier predicted 405.3, 419.3 and 437.3 amu fragment ions that were detected in the ESI spectrum. Likewise with a M+.precursor, Mass Fronteir predicted 367.3, 382.3 and 423.3amu fragment ions which were only detected in the APGC spectrum. Figure 3. Comparison of high energy APGC-QTof MSE(bottom) and UPLC-QTof MSE (top) spectra of Vanox 1290in the 275 to 450 m/z region. APGC analysis yielded three unique fragments at 367.3, 382.3, and 423.3 m/z noted by red arrows. MassFrontier software (HighChem, Thermo) assisted with structural assignment of the fragment masses. Mass Spec Lab’s G2-S QTof is readily coupled to either its ESI or its APGC source. Sources can be interchanged within minutes. Hence it is practical to apply ESI and APGC analyses to a sample for a thorough workup. A combined set of APGC and ESI fragments is expected to improve the confidence of compound detection in targeted studies and MS-based structural deconvolution in untargeted studies. Mass Spec Lab is currently testing the performance of an in-house ESI/APGC fragment library and anticipates reporting on these findings in a future technical note. In summary, APGC QTof provides high sensitivity, accurate mass NIST-like fragment spectra when high energy is applied and in the same run CI-like soft ionization spectra when low energy analysis is applied. In addition, APGC and ESI analyses can be combined to improve sensitivity through selectivity and also increase the structural information to improve structural elucidation. NIST Chemistry WebBook, accessed November 9, 2015. The QTof instrument in this study uses calibration reference files with neutral monoisotopic exact masses, therefore the accurate mass calculation is based on neutral monoisotopic exact mass and does not account for the exact mass of proton and electron differences detectable in the fourth decimal place.